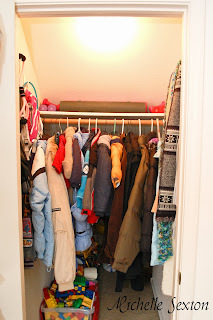 Does anyone have a disastrous coat closet? We did. There are so many things to store in that confined space that keeping them organized was a huge challenge. 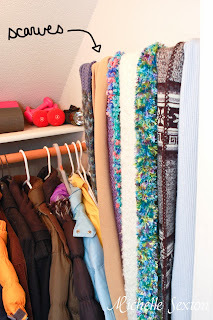 Our coat closet opens up into our living room and goes back underneath the staircase. It's not huge or anything, but it's definitely bigger than the average coat closet. The problem that we had was that it serves more than one purpose. 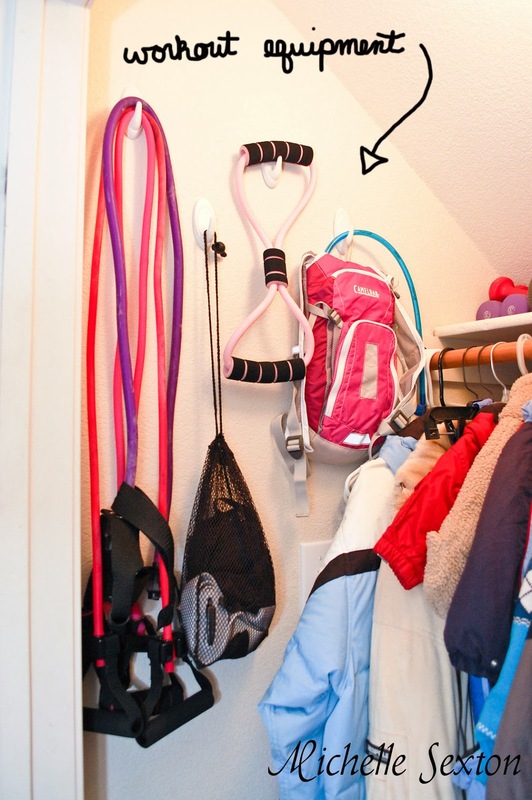 It also serves as toy storage/mini-play room/coat closet/winter accessories/workout equipment storage closet. 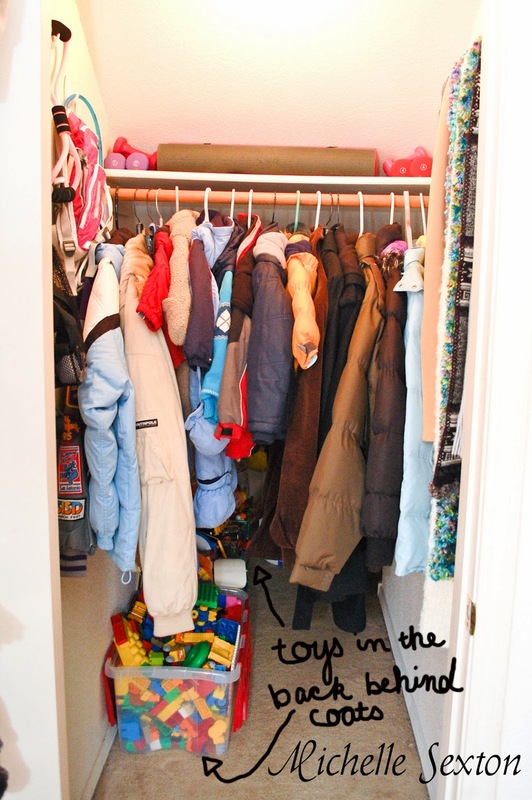 One of the biggest issues with having a multi-functioning closet is keeping the kids' toys separate from everything else AND providing quick and easy access to the non-toy items. There are tons and tons of organizational-friendly items that you can buy, but that can get expensive, especially if you need several items. When it comes to home organization, I like to keep it simple and I try to use items I already have (or are inexpensive to purchase) to stay organized. 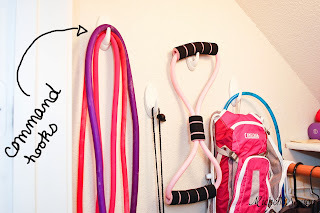 So, here are a couple of simple and inexpensive organization ideas that I came up with using normal household items. I use an over-the-door shoe organizer behind our closet door to store all of our winter hats, baseball caps, mittens, gloves and sunglasses. This makes them easily accessible and they're also more likely to get put away after use. I recommend putting the kids stuff in the bottom pockets so they can pull them out and put them away without help. 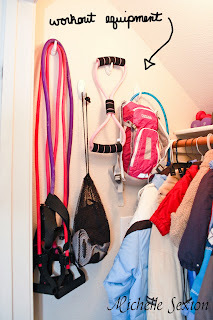 I put Command Hooks (about $8 on Amazon) on an empty wall on the side of the closet to hang miscellaneous items we use for working out like resistance bands, straps, and the CamelBak. 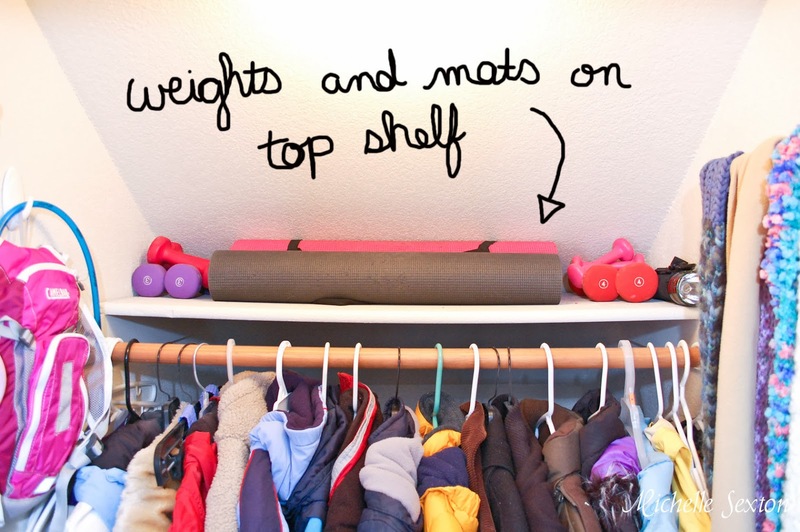 The top shelf is used for yoga mats, small hand weights, and a flashlight (for all those I-can't-find-anything-in-the-dark-where's-the-flashlight moments). Just a side note here: I normally avoid storing weights on shelves, due to the fact that they tend to make the shelf bow. However, since this closet is shared with the kids' toys, the last thing I need is for my boys for have access to the weights and drop them on their toes. I store the weights at the end of each side of the shelf above the braces, which has yet to cause any bowing. 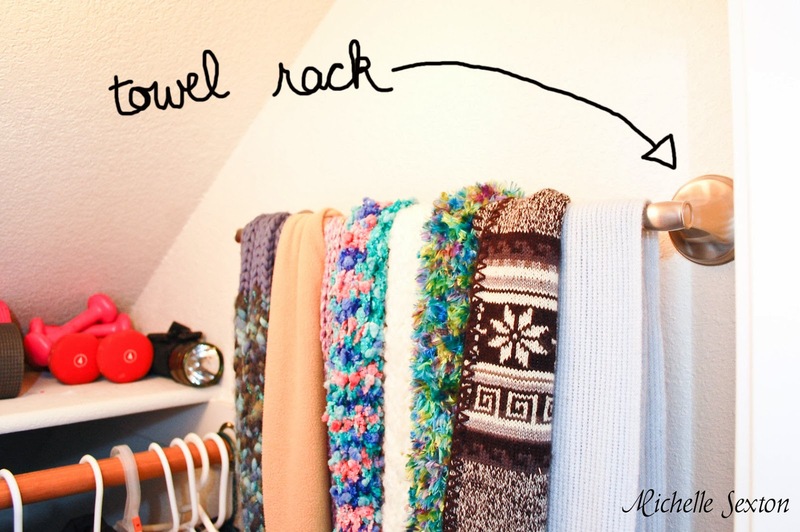 I installed a small towel rack (about $13 on Amazon) on the opposite side wall of the closet to hang scarves. 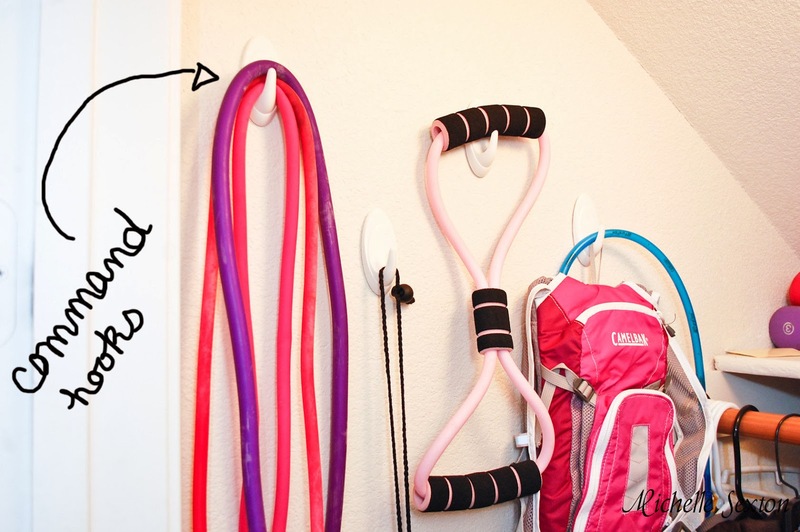 Hanging them on the towel rack makes it so much easier to find them, plus they stay in place instead of falling off the hangers and onto the floors. 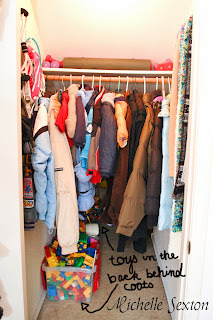 The boys' toys are stored behind the coats toward the back of the closet. All of the toys have their own place. All blocks are stored in one container, cars have another container, puzzles have their own place, etc. Large toys go into a giant bin in the back of the closet. Because there is only one light at the front of the closet, the back part of the closet is dark, so we hung battery operated motion detector lights in the back so they can sit in the back of the closet and play. 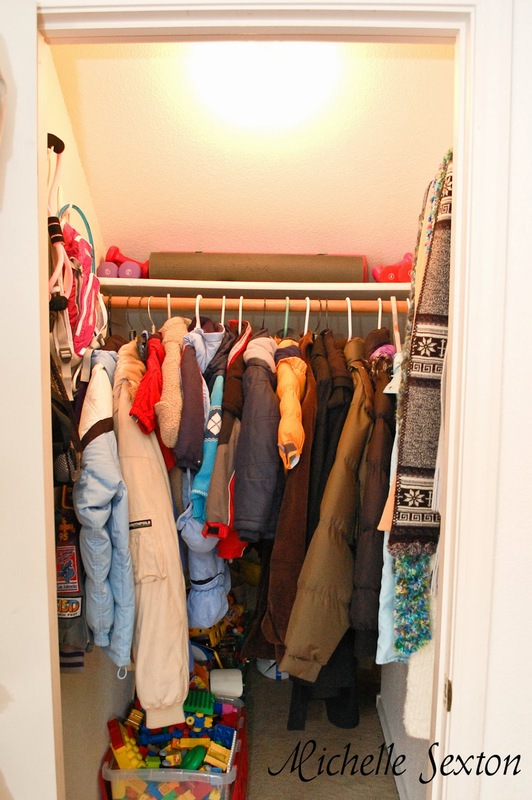 Now that the coat closet is well organized, getting out of the house is a bit easier, items are more likely to get put away after use and the toys all have their own place. I do still have to keep after the boys to make sure their toys get put away in the correct places, instead of just tossing them inside the closet at will and shutting the door. 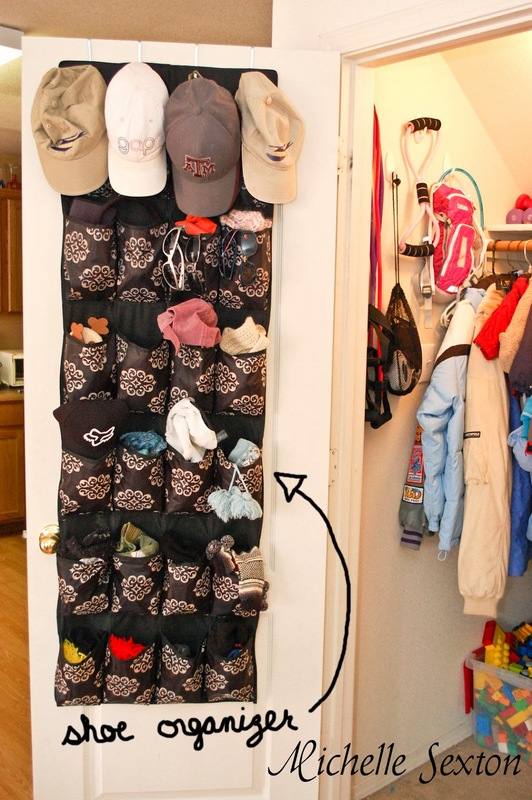 ;) How do you keep your home organized? By the way, I am getting surgery on my nose tomorrow to fix my deviated septum. I broke my nose when I was a teenager (on a Slip N' Slide at summer camp) and have had sinus trouble ever since. 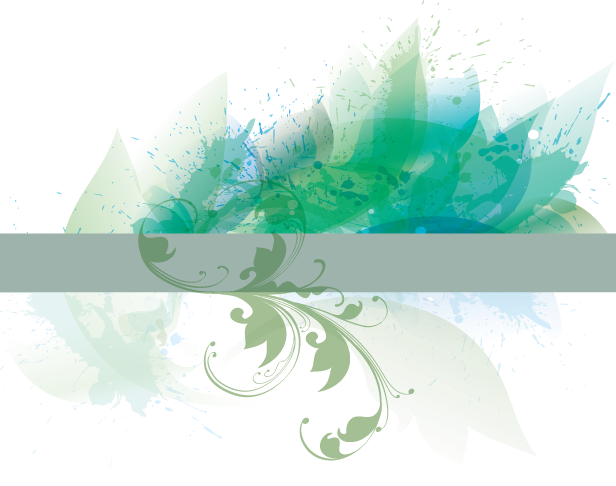 So I will be out for a week or so BUT I do have a couple of guest bloggers filling in for me while I recover. Don't miss their posts! Hopped over from the One Project at a Time link party. I love your towel rack idea for scarves! Thanks for sharing!